Calling all community groups, businesses and paper collectors! 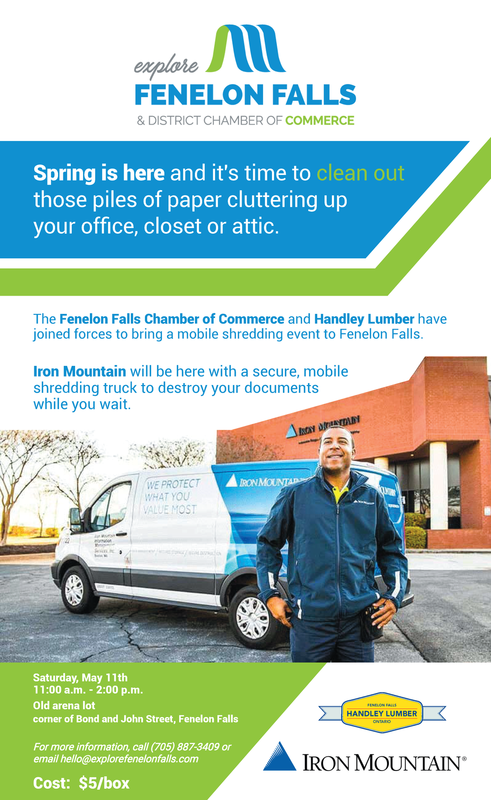 Spring is here so there’s no better time to collect your boxes of personal and business documents and bring them to the community mobile shredding event. Drive up with your boxes and watch as they are professionally and securely destroyed in the Iron Mountain shredding truck while you wait. This community event is brought to you by Handley’s Lumber and the Fenelon Falls Chamber of Commerce. For more information please contact Marylee at 705-887-3409 or hello@explorefenelonfalls.com. When: 11:00 a.m. to 2:00 p.m.
Spring is here and there's no better way to get out and connect with friends and neighbours than volunteering at the 35th Annual Country Living Show. Bring your smile, your enthusiasm and your love for Fenelon Falls to help us make this another great showcase for our local businesses, artisans and community groups. See you at the show! Call Marylee at the Chamber Office for more information 705-887-3409. Are you operating a home business, freelancing or starting a new business or organization? Perhaps you travel or have a cottage in the area and you’d like a place to catch up on things back at the office. Shared workspaces (co-working) fill a need for freelancers and home businesses and startups to access inexpensive public space in which to do business, meet clients, find complementary talent, learn new strategies and collaborate on projects together. Participants share the operating costs and benefit from things they might not have at home: high-speed wifi, enterprise-level photocopying, a business address and a place to hold a meeting, workshop or create a podcast. The Fenelon Falls Downtown Revitalization team is looking into the feasibility of a shared office hub of some sort to help our home businesses and freelancers and startups thrive and to create a welcoming place for such businesses or organizations that wish to relocate here. Interested? Please come to Sweet Bottoms Coffee (19 Colborne St. Fenelon Falls) this Sunday afternoon, 2 p.m. (7 April) or next Sunday afternoon (14 April) at the same time. Let’s discuss what we’d want and need from a shared work environment in town. The Board of Directors of the Kawartha Lakes Community Futures Development Corporation (KLCFDC) will be having a Meet & Greet on April 17th at Home by Tim + Chris on Colborne Street. Fenelon Falls Chamber of Commerce President Tim Wisener will co-host the event along with the KLCFDC’s Board Chair, Paul Reeds. The CFDC has provided support to numerous Fenelon Falls and area projects over the years including dock extensions at the locks, the revitalization of the Fenelon Falls Marquee, updates to Garnet Graham Park, the Rotary Club Splashpad and the Fenelon Falls Chamber’s “More Ways to Have Fun” tourism campaign. They have also supported private businesses such as the Fenelon Falls Brewing Co. and the Peter Shennett Professional Corporation. “This is an organization that has continuously seen its way to assist so many community-based and private ventures over many, many years,” President Wisener said. “It will be great to talk first-hand to these folks who have provided so much to our community and others across the Kawartha Lakes and let’s remember, they are all volunteers!,” he added. The doors will open at 3:15 pm at 44 Colborne Street and there will be light refreshments served. Everyone is welcome but if you are interested please call Marylee at the Chamber, 705-887-3409 so that she can help track the numbers expected to attend. Job seekers and employers looking to hire were brought together at the Fenelon Falls Job Fair hosted by VCCS Employment Services and the Fenelon Falls Chamber of Commerce on March 27th. Fourteen local employers had a variety of part time, full time and seasonal positions available for the crowd of nearly 70 attendees seeking employment. VCCS also had over 70 job postings for positions in Lindsay and surrounding area that needed to be filled, and 100 jobs on their job board total. A highlight of the job fair was the fact that it was held right here in Fenelon Falls and therefore significantly reduced the transportation barrier. Local students walked to the Community Centre after school and for those with a vehicle there was ample parking and accessible facilities. Thank you to all the employers, VCCS staff and the public who made this inaugural event such a success. Due to the positive feedback the Chamber of Commerce will look for future opportunities to partner with VCCS to support local employers and job seekers to help build a strong, thriving community right here in Fenelon Falls. A shout-out to Sobeys Fenelon Falls for generously underwriting refreshments at our recent "Building a Circle" workshops, held in collaboration with Community Living, March 19 and 20. The workshops were geared to those interested in enabling people living with a developmental disability to live their best life in our community. It's so encouraging to have the backing of our local businesses.